Mika Hakkinen learned it the hard way: Motorsport can be very cruel sometimes. All Grand Prix drivers and team bosses have learned that from their own experience, but no matter how ready you are, what happened to Hakkinen at last Sunday's Spanish Grand Prix was one of the cruellest tricks Formula One has played on any Formula One driver in the history of the sport. Ten years had gone by since Nigel Mansell was victim of a similar destiny, his Williams stopping on the final lap of the 1991 Canadian Grand Prix when he was already waving to the crowd. On Sunday, history repeated itself, and while Hakkinen held a 45-second lead over Ferrari rival Michael Schumacher, his McLaren began to spew flames with just five corners of the race remaining, robbing him of what would have been a much needed win. 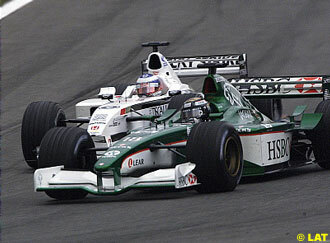 In 2000, the Spanish race was the inflection point for Hakkinen's title bid. He was 22 points behind Schumacher, but he performed as usual at the Circuit de Catalunya and took a victory which signalled his comeback, when everything seemed to be on his rival's side. This year, the situation was similar. Hakkinen was again 22 points adrift of Schumacher, and having scored only four points in the first four races, the Finn needed to count on his Spanish revival once more. He did everything he had to. He lined up alongside a dominant Schumacher during qualifying, drove a flawless race and, when the moment was right, he pushed hard and took advantage of the German's problems to jump into the lead. This time though, luck was not on his side. "I'm super-disappointed - goddamn it, you know, Jesus," spluttered Hakkinen after the race. After a fourth and a sixth place finish in five races as his best results, it must be very hard for the two-time World Champion to remain positive for the rest of the year, especially now that he lies 32 points behind Schumacher. The Ferrari driver was not in the lead entering the final lap of the race, but his performance was brilliant too, and only a problem with his third set of tyres deprived a record-breaking Spanish crowd of a head-to-head battle between the two top men in Formula One. Like a pendulum, luck seemed to desert the German halfway through the race, only to come back to him on that fateful final lap. As things stand, and despite two races where he seemed to have lost his way, Schumacher must be the clear favourite to take this year's title, especially after David Coulthard endured one of those weekends that seem to be part and parcel of the Scot's every season. It was ironic that, having warned about the possible danger of some cars being stranded on the grid due to the automatic launch system, Coulthard was the only one who saw his engine die when it was time to move. Despite initially claiming that Coulthard had suffered from 'brain fade', McLaren boss Ron Dennis later retracted his comments and apologised to his driver once the team discovered it was in fact due to a software glitch - much as Coulthard had prophesized. Without that problem, and despite having to come into the pits on the first lap after losing his front wing, Coulthard would have probably won the race. Of course, "ifs" and "buts" have never scored any points in Formula One, and the Scot had to settle for fifth place, continuing with his consistent run of points-scoring finishes. Five races into the season, Coulthard is 24 points ahead of teammate Hakkinen, who hasn't won a Grand Prix since August last year. If Coulthard finally wants to get all his team's attention in order to fight for the title, this year seems to be his best opportunity ever, and seeing where Hakkinen stands, he's probably McLaren's best choice. As it has often been the case in the past, the Spanish Grand Prix put everyone in their place, most significantly the Williams team, after a dominant win at Imola were unable to keep up with the top two. However, the Grove-based team were able to celebrate Juan Pablo Montoya's first finish, and the Colombian did it in style with second place. Watching Montoya on the podium and in the press conference was a refreshing view, as was Jacques Villeneuve's long awaited return to the top three. After a difficult start to the season, the Canadian rewarded the BAR team with their first ever podium finish and, not underestimating Olivier Panis's excellent work, it was Villeneuve who deserved the honours after three difficult seasons at BAR. For those who skipped all the headlines for the past few months, the Spanish Grand Prix would have been a straightforward affair - just another round of the 2001 season - and not the D-Day that it was supposed to be, courtesy of the re-introduction of the electronic aids. Of course, there was much to read between the lines to see the real effect... or was there? The grid order remained unchanged, no one seemed to benefit or lose from it, drivers were still spinning, Hakkinen turned it off to complete his fastest lap during qualifying, and Montoya finished second running without it during the race. As for the automated launch triggers, except for Coulthard's and Heinz-Harald Frentzen's problems at the start, it didn't seem to make a difference either, and it still seems to be a matter of reaction time from the drivers. To prove it, Montoya gained a massive six places at the start. Perhaps the teams and their engine providers had developed their engine management software so effectively that traction control and launch systems are not making any difference. Or perhaps it's still early days to judge their effects. From what we saw in Spain, at least the sport will benefit from the end of the cheating rumours, and that's good news for everybody. Coming to the Barcelona circuit, and following their disappointing performance at the San Marino Grand Prix two weeks earlier, it seemed that Ferrari have lost the initial edge they held over their rivals, and not only to McLaren, but also to the Williams team. Everything looked set for a revival from Mika Hakkinen, at a track he has always excelled at, having won the last three races. So perhaps it came as a bit of a surprise to see Michael Schumacher seizing a dominant pole position for the Spanish Grand Prix. The 0.085s advantage over Hakkinen at the end of the hour-long session did not seem to reflect Schumacher's dominance, as the German only needed two of his four attempts to score his fourth pole of the season in five races. Despite the weather forecast predicting likely showers for Saturday, conditions at 1:00 pm were perfect, with a temperature of 29° Celsius on the track, so it took some time before the top contenders jumped onto the track. David Coulthard opened the fight for pole 18 minutes into the session, the Scot lapping within the one minute 18 seconds bracket (1:18.635), already more than two seconds faster than last year's pole time. Coulthard, however, was not too happy with the balance of the Mercedes-powered MP4-16, which tended to understeer with all the traction control options turned on. Coulthard's time would stand for some ten minutes despite Juan Pablo Montoya, Rubens Barrichello and Mika Hakkinen's attempts four minutes after the Scot had set his time. 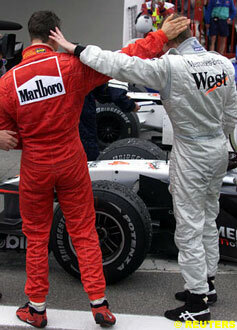 Hakkinen was the only one who was able to get close to Coulthard's time, being three tenths slower than his teammate. 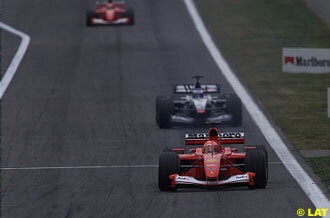 Barrichello's first run was good enough for third, while an impressive Kimi Raikkonen was fourth. It was clear from the moment he completed his first attempt that San Marino Grand Prix winner Ralf Schumacher and the Williams team were right to play down expectations coming to Spain despite their dominant performance at Imola. As BMW boss Gerhard Berger explained, "The problem we have here is that it is a circuit where you need more downforce and we are not as advanced as we wanted to be with development of traction control." Ralf, however moved up to third spot right before his brother Michael began his first flying lap. 26 minutes into the session, Schumacher set a staggering 1:18.226 with apparent ease, lapping more than four tenths quicker than Coulthard, who took to the track for the second time halfway through the session but was unable to improve his own time, let alone challenge Schumacher's provisional pole. Hakkinen's second attempt was not good enough to improve either, and he stayed third in front of Barrichello, who did improve on his second run. Schumacher and Coulthard returned to the track with 22 minutes of the session remaining, only the German was on his second try while the Scot was on his third. The McLaren driver was again unable to improve, but Schumacher bettered his own pole time to 1:18.201, making it look even easier than on his previous run, stretching his lead over the Scot. Further back, German Nick Heidfeld finally made it into the grid with only 15 minutes of the session left, the Sauber driver having to switch the spare car after a mechanical problem. Just after the 50-minute mark, Hakkinen, having improved his time but not his position on his third run, was demoted by Barrichello, who was incapable of moving out of his teammate's shadow. With five minutes remaining, it became evident that Schumacher was to use only three of his attempts, and he must have had second thoughts after seeing Hakkinen improve on his first split while completing his final try. The Finn had decided to turn some electronic options off, and in a more 'old-fashioned' method he leapfrogged Coulthard for second spot and nearly stole Schumacher's pole. "To be honest I'm disappointed not to get pole position," admitted Hakkinen. "On my last and fastest run, I was three tenths of a second ahead until turn five when I lost the back end a bit. Before then all my runs had been affected by traffic so it was only towards the end that I was able to maximise the car." 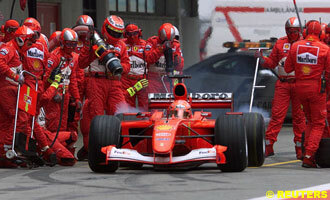 Having learned his pole was secure, Schumacher didn't even bother to complete his third attempt, returning to the pits after running only eight of the twelve allocated laps. "Ross (Brawn) mentioned to me there was no point to do the lap, and come in," Schumacher said. "The times were slightly down I think because the wind had moved a little bit faster so there was no point." Coulthard had to settle for third after being unable to better the time from his first attempt, but he found consolation in the fact that he would start from the clean part of the track: "Today my only clean run was the first one and I was not so happy with the balance later on. On my last run, there was just too much traffic, but if the system works well tomorrow, I have the clean half of the track so I can make up a place." Barrichello was fourth while Ralf occupied fifth spot, his worst qualifying performance so far this season, and led a group of six drivers who were separated by a mere two tenths of a second. That was just a reflection of a really close field, with Montoya less than 1.5 seconds behind the pole sitter, in a disappointing 12th position. Further back, Luciano Burti out-qualified new teammate Jean Alesi in only his first race with Prost. The Brazilian held the upper hand during most of the weekend over his replacement at Jaguar Pedro de la Rosa who, in front of his home crowd, was only able to set the 19th fastest time. Finally, the predicted clouds for Friday and Saturday made their appearance on Sunday, and by the time the race was about to start, the possibility of showers was enough to cause concern among the teams. And, as was the case so often this year, the action began before the cars got moving. The Benetton team continued with their nightmare season, and having qualified behind the Minardi of Spanish sensation Fernando Alonso, Giancarlo Fisichella was forced to take the spare car before the start. However, the Italian's luck was not as bad as David Coulthard's, who saw his car left stranded when the formation lap began. "Based on an initial analysis we felt that David was responsible for stalling on the dummy grid but closer scrutiny confirmed that a glitch in the software was at fault," McLaren boss Ron Dennis said after the race, having first accused his driver of "brain fade." His fault or not, Coulthard was forced to take the start from the back of the grid, effectively giving up all hopes of fighting for the win. The fears of car stalling on the grid due to the drivers' relatively poor knowledge of the automated launch systems were only materialised by Heinz-Harald Frentzen, who did not stall his engine, but was unable to move for a few seconds. Fortunately, the rest of the field avoided him. There were no big gains or loses for the rest of the field, except for Juan Pablo Montoya who, aided by electronics, moved up from 12th to sixth before the end of the straight. 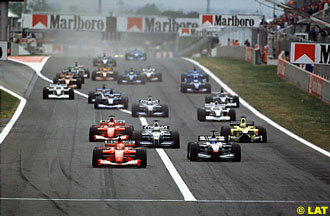 Up in front, Michael Schumacher had to take the inside line at the first corner to stop Mika Hakkinen from passing him. Ralf Schumacher and Jarno Trulli had passed Rubens Barrichello, but in the only highlight of his race, the Brazilian overtook both drivers around the outside of turn two. At that same corner, Coulthard's nightmare continued, as he was pushed from the back and crashed into another car, losing his front wing, which forced him to cruise around the track before coming into the pits to replace it. Brazilian Enrique Bernoldi was the other driver involved in the incident, also being forced to come in from repairs. Schumacher and Hakkinen - two seconds away from each other - began to pull away from Barrichello and Ralf, already anticipating a two-horse race. The real action was at the back of the field, where Heinz-Harald Frentzen and Pedro de la Rosa were fighting for 16th place until the German dived on the inside of the Jaguar driver. The move seemed successful, but the Jordan star lost the back of his car and crashed into the Spaniard who, on his debut with the team, was left with nothing to celebrate for. The other local hero, Minardi's Fernando Alonso, was again showing his amazing talent, fighting hard with his three-year old engined car to pass the Benetton of Fisichella, who was slowing down the Spaniard. As things stands, it could be that the 19-year old will be driving the blue cars next season. 15 laps in to the race, the order at the front continued unchanged, with Schumacher still some two seconds in front of Hakkinen, and Barrichello another five seconds further back. Ralf was a distant fourth, in front of Trulli, Montoya and Jacques Villeneuve, who was fighting his way back into the points after passing Sauber's Nick Heidfeld. Six laps later, Ralf's race came to an end after spinning off the track under braking. "I really don't know what happened when I spun," the German said. "When I was braking just before the left hander the car felt fine. Suddenly the rear came round, I spun off the track and got stuck in the gravel." On that same lap, teammate Montoya come into the pits for his first scheduled stop, right behind Trulli, with whom he was fighting for fourth. The Williams pit crew completed a fine job, and the Colombian moved ahead of the Italian. Race leader Schumacher pitted on lap 23, rejoining in third spot. Hakkinen then began to push however, Schumacher's lap times on fresh tyres were too fast for the Finn, who came into the pits on lap 27, returning to the track still in second place. After the first round of pitstops the top three remained unchanged, while Montoya was fourth, Villeneuve fifth and Trulli in sixth. Meanwhile, a charging Coulthard was recovering well from his first-lap nightmare, already running 11th. Trulli was to be the first of the front runners to pit for the second time, on lap 40. Montoya and Villeneuve were next a lap later, pitting at the same time. The Williams crew was again effective and the Colombian was able to maintain his position when he rejoined the race. Schumacher's gap over Hakkinen was around four seconds when the German came in for his second stop on lap 43, allowing Hakkinen to take the lead. It was clear from his first lap, that Schumacher was unable to match his early speed, while his McLaren rival was pushing harder than ever. Meanwhile, Barrichello, who had stopped for the second time on lap 44 and was running in the middle of nowhere in third place, ran wide and off the track four laps later, the Brazilian affected by a suspension failure on his F2001. He came into the pits to replace his tyres, but his race was effectively over. So was Irvine's, who also retired after his most competitive drive of the year. 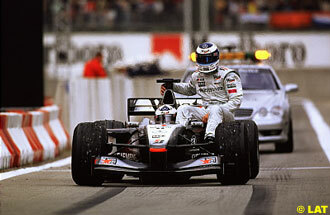 After setting his fastest lap of the race, Hakkinen finally pitted on lap 50, emerging into the lead - some three seconds in front of Schumacher, who was struggling with his car and with traffic. Due to Barrichello's retirement, Montoya was now up to third, Villeneuve was fourth, Trulli fifth and Heidfeld completed the top six. Coulthard was now seventh. Running two and three seconds a lap slower than Hakkinen, Schumacher's problems were visible, and even from the onboard camera shots it was clear that the German's car was not handling as expected. "I had a very bad vibration and I thought maybe the tyre was delaminating," Schumacher said later. "So I slowed down, especially down the straight, as I was worried about a blowout. We even talked about making a third pit stop. Then the vibration did not get any worse and I realised it was safe to go on." 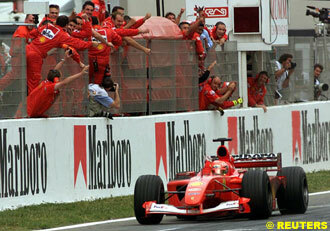 However, with over a minute over Montoya, Ferrari's decision not to change Schumacher's tyres was a real mystery. Hakkinen continued running impassively towards what seemed set to be his first win since last year's Belgian Grand Prix, and entering the final lap, his advantage over Schumacher was more than 40 seconds. But with a few corners remaining, the race was still far from over, and in the cruellest of blows Hakkinen suddenly slowed down, his car spewing fire and smoke. The Finn tried, in vain, to coast to the end of the lap. "I thought 'Wow, I'm going to win for the fourth time in Barcelona. If that happens it's incredible," said Hakkinen. "Then on the last lap I said 'Okay, now I understand, it can't be this good to be true. It looks like there was some problem with the clutch, there was nothing that I could do to try to save the situation. I tried to make some adjustments in the car to try to reduce the problems that I was experiencing. But it didn't make any difference." Even Schumacher could not believe it as he crossed the line in first place to score his 47th career win, ahead of Montoya and Villeneuve. 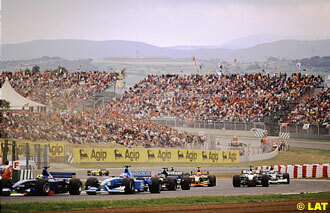 Trulli was fourth, again scoring some valuable points for Jordan, while Coulthard finished fifth after a good recovery. Heidfeld took the last point for Sauber. "I have to say I feel very sorry for Mika," admitted Schumacher after consoling Hakkinen. "I was shocked when I saw he had retired. This is not the way I like to win, but it has happened to me in the past and these things happen in racing." As it turned out, Schumacher left Barcelona with 8 points over Coulthard, but more importantly: with 32 points over Hakkinen. "Sometimes things just don't go like you want them to go," concluded Hakkinen. He couldn't have been more right. Giancarlo Fisichella switched to his spare car before the start of the race. As the cars fire up for the final parade lap David Coulthard's McLaren is left behind on the grid. The car gets going but David is forced to start from the back of the grid. Lap 1: At the start everyone gets away well apart from Heinz-Harald Frentzen. The Jordan driver does manage to keep his car moving but is amongst the tailenders at the first corner. Michael Schumacher gets into the first corner ahead of Mika Hakkinen, Rubens Barrichello, Ralf Schumacher, Jarno Trulli and Juan-Pablo Montoya. Just after the first corner Coulthard collides with Enrique Bernoldi's Arrows. Coulthard loses his front wing and both men have to pit at the end of the lap. Lap 2: Schumacher sets the fastest lap of the race and builds up a lead of just over a second while Hakkinen pulls a second and a half clear of Barrichello. Lap 3: As Schumacher edges away at the front, the order remains the same. Further back Olivier Panis overtakes Kimi Raikkonento grab 10th position and Fernando Alonso, who was running 16th, drops behind local hero Pedro de la Rosa and Frentzen. At the tail of the field Coulthard sets the fastest lap of the race. Lap 4: Panis challenges Eddie Irvine for ninth place but the manouevre is not successful. Coulthard sets another fastest lap as he tries to make up ground. Lap 5: Schumacher's lead has grown to nearly two seconds but the order at the front remains unchanged. Lap 6: Frentzen challenges de la Rosa for 16th place. The two cars collide in Turn 10 and both men retire. Lap 9: Nineteenth-placed Bernoldi retires his Arrows with a mechanical problem. Lap 13: At the tail of the field Coulthard catches and passes Tarso Marques for 18th position. Lap 15: Coulthard overtakes Jenson Button for 17th place. 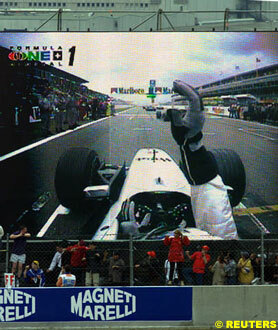 Lap 16: Michael Schumacher sets the fastest lap of the race and builds his lead to two seconds for the first time. There is a gap of five seconds back to Barrichello. Ralf Schumacher remains fourth with Trulli fifth and Montoya sixth. Jacques Villeneuve was running seventh ahead of Nick Heidfeld, Irvine, Panis and Raikkonen. At the tail of the field Alonso pits and drops from 16th to 19th. Lap 17: Coulthard overtakes Giancarlo Fisichella to take 15th position. Behind them Button pits. Lap 19: The order is unchanged at the front while in the midfield Jos Verstappen pits and drops from 12th to 16th. Lap 21: Fourth-placed Ralf Schumacher spins off. Trulli and Montoya both pit. The Williams stop is faster and the Colombian comes out ahead. This moves Villeneuve up to fourth place. Lap 23: Schumacher pits and rejoins in third place. Further back Villeneuve stops and drops from fourth to eighth. Also pitting are Raikkonen, Jean Alesi and Fisichella. Lap 24: Hakkinen sets the fastest lap of the race as he tries to build up an advantage before his pit stop. Heidfeld, Irvine and Panis all pit as does Luciano Burti in 10th place. Lap 25: Barrichello stops and drops behind Schumacher. 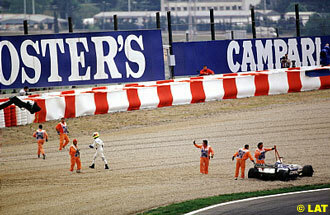 Michael sets the fastest lap of the race as he tries to make sure he is ahead when Hakkinen pits. Lap 27: Hakkinen pits but rejoins just behind Schumacher. Barrichello remains third with Montoya fourth, Villeneuve fifth and Trulli sixth. Heidfeld is seventh with Coulthard having risen to eighth as others pitted. Lap 28: Coulthard pits and rejoins in 11th. Lap 38: After 10 laps of battling the gap between Schumacher and Hakkinen is much the same. The top six remains unchanged. Ninth-placed Raikkonen is the first man to stop for the second time. He drops to 11th. Lap 39: Heidfeld stops and drops back to 10th. At the back of the field Verstappen and Alonso both stop for a second time. Lap 40: Trulli pits from sixth position and drops to 10th. Further back Fisichella goes into the pits for his second stop. Lap 41: Montoya and Villeneuve stop together. Montoya gets out ahead but Villeneuve finds himself behind Coulthard. At the tail of the field Marques and Button both pit. Lap 42: Schumacher remains four seconds ahead of Hakkinen with Barrichello third and then a huge gap back to Irvine (who has yet to stop for a second time). Panis is fifth with Montoya sixth, Coulthard seventh and Villeneuve eighth. Trulli is ninth and the top 10 is completed by Heidfeld. Lap 43: Schumacher pits and Hakkinen goes into the lead again. Further back Panis pits from fifth and drops to 10th. Lap 44: Barrichello comes in for his second stop. He is able to hold on to third place. Coulthard also pits from sixth place. He rejoins 10th. Schumacher's lap times are not good and Hakkinen is able to increase his advantage. Lap 45: Irvine stops and drops from fourth to eighth. Lap 48: Barrichello runs wide and goes over a gravel trap. He pits at the end of the lap and drops to seventh. Lap 49: Barrichello pits again and retires. Also out is Irvine who stops with a mechanical problem. Lap 50: Hakkinen finally pits and emerges in the lead. 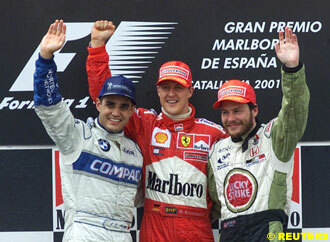 Schumacher is second with Montoya third, Villeneuve fourth, Trulli fifth and Heidfeld sixth. Coulthard is a lap down but ahead of Panis and Raikkonen. Lap 52: As Hakkinen pulls away from Schumacher, who reports tyre problems, there is a lively battle at the tail of the field as Button overtakes Marques for last place. Lap 60: The gap at the front has grown to around half a minute but the order is unchanged. 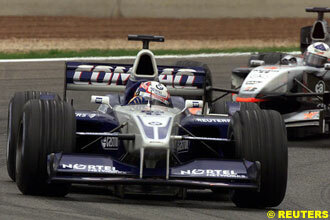 Coulthard overtakes Heidfeld on the run down to the first corner and moves into the points. Lap 65: As Hakkinen crosses the line to begin his last lap there is a loud bang at the back of the car as the clutch explodes. The car coasts down to the first corner and has sufficient momentum to get to Turn Seven. Schumacher takes the lead with Montoya moving to second place and Villeneuve to third. Trulli inherits fourth place with Coulthard fifth after a strong drive. Sicth place goes to Heidfeld with Panis seventh and Raikkonen eighth. Hakkinen is classified ninth.